departments. The total available vacancies in SGPGIMS Recruitment are 102 posts. Candidates with eligible criteria may apply for Sr. Resident vacancies using the SGPGIMS official website www.sgpgi.ac.in. Fill the required fields in respective application and submit through online before 22-11-2017. Application fee for all candidates is Rs. 1000/-. Last date for payment to fill application through online is 20-11-2017. Pay Scale for Senior Resident Jobs is Rs. 8600/- plus GP of Rs. 6000/- and for Demonstrator Jobs is Rs. 17440/- plus GP of Rs. 5400/- plus Allowances. Candidates will be selected for Sr Resident Jobs in SGPGIMS Recruitment is based on academic qualifications and Performance Interview. 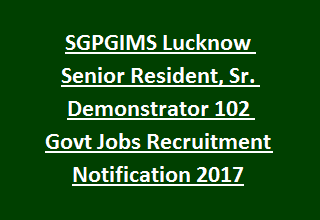 Please follow the below given details for Application procedure, Selection Procedure, Age limit, Relaxations, Scale of pay, Important Dates of Sanjay Gandhi Postgraduate Institute of Medical Sciences SGPGIMS Recruitment of 102 Senior Resident, Sr. Demonstrator Jobs Recruitment Notification 2017. Total available vacancies in Sanjay Gandhi Post Graduate Institute of Medical Sciences SGPGIMS Recruitment are 102 posts. -Maternal & Reproductive Health: 04 posts. -Paediatric Surgical Super Specialities: 12 posts. -Plastic Surgery & Burns: 05 posts. -Surgical Gastroenterology (Liver Transplant Unit): 02 posts. Pay Scale for Sr Resident Jobs is Rs. 8600/- plus GP of Rs. 6000/- plus allowances. Pay Scale for Demonstrator Jobs is Rs. 17440/- plus GP of Rs. 5400/- plus Allowances. Sr Resident: MBBS degree from the University recognized by Medical Council of India/ MD/ MS in concerned subject. Must be registered under state or central Medical Registration Act. See the SGPGIMS Notification for More qualifications. SGPGIMS Senior Resident Recruitment selection is based on academic score and performance in Interview. Application fee for all Candidates is Rs. 1000/-. Interested candidates have to go through Sanjay Gandhi Postgraduate Institute of Medical Sciences SGPGIMS official website www.sgpgi.ac.in and apply for Senior Resident jobs in relevant department. Online application form submission last date is 22-11-2017. Last date for submission of SGPGIMS hardcopy of application is 25-11-2017.